Answer is quite simple following win! HIS name is a question which is easily answered following Whats In The Esky’s victory at Tabcorp Park Melton last night. Unbeaten from three starts this season, Whats In The Esky made sure there is an abundance of premium refreshments in the iconic Aussie cooler this morning! “We couldn’t be happier with him,” trainer Allan McDonough said. “There are a few of us in him and we all love a drink. “The Esky is full and we’ll be enjoying his win on a perfect sunny spring Sunday. McDonough explained the four-year-old’s name extends from a comment made following the purchase of a colt at the 2015 Melbourne Australian Pacing Gold Sale. “Adrian Darcy was with us at the sale and he was the only one there with an esky,” McDonough recalled. “After he put up his hand for the winning bid the auctioneer said ‘sold to man with the esky’, which is what we named that horse…Manwiththeeski. 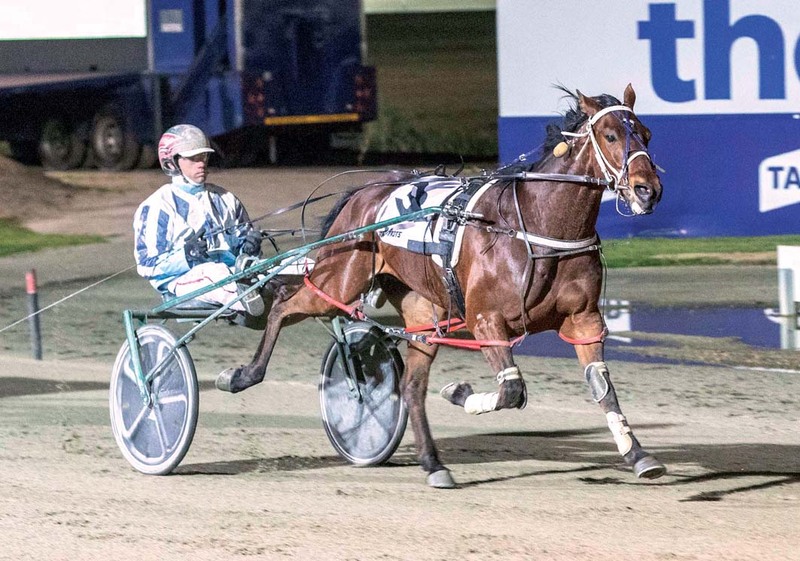 Purchased at the 2016 Australian Pacing Gold Sale, Whats In The Esky has thrived since returning from a spell, with his latest win coming with Greg Sugars in the cart. After finding the lead from barrier three, Whats In The Esky was eased to take a trail behind Wanted Lady, which was surged to the front from gate four. Angled away from the pegs leaving the back straight, the son of Western Edition cruised to an effortless seven-and-a-half metre win from the pacemaker, with Ozzie Major a half-head away third in 1:58.1 over 2240 metres. “His work and form since I moved to Ballan has been sensational,” McDonough said. “I expected him to come back better after a short break, but not as much as he has, which has been a bit of a shock. “Since being at Ballan I’ve been able to fast work him, where as previously I couldn’t do it as much on my smaller tight track, and he has grown a leg. “He is beating my metro horses at home so I can’t see any reason why he won’t go through the grades. That’s why he is the top ranked local!